The Easter Vigil is a growing tradition at Church of Our Saviour where we gather to keep vigil in the hours of Holy Week when tradition holds that the powers of death were broken by God in Christ. This podcast shares some of the reflections and readings from this year's Vigil, as offered by the people of Church of Our Saviour. In addition to scripture readings by our members, The Rev. Este Cantor offers a reflection on the creation stories of Genesis, The Rev. Betsy Rosen responds to the reading of the story of the valley of dry bones in Ezekiel, and The Rev. 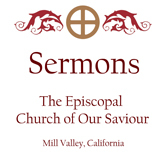 Richard Helmer reads the Easter Sermon of John Chrysostom.